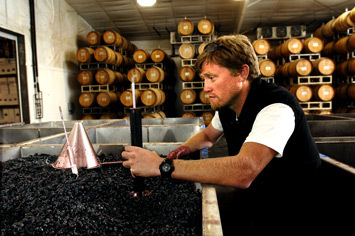 Great photo here of Mike Sharon, production winemaker at L'Ecole No. 41. As you are driving into the Walla Walla area, in the town of Lowden you notice a beautiful schoolhouse on your left with a large flagpole. One of the standout wineries in Walla Walla, L’Ecole No. 41 has impressed with their latest set of releases. The winery is set in a 1915 schoolhouse and is the perfect location to taste some of the valley’s most consistent lineup of red and white wines. Marty Clubb serves as managing winemaker and oversees all vineyard management. Production winemaker Mike Sharon has been with L’Ecole since 1996 having previously served at Canoe Ridge. Marty and Mike oversee over 90 lots of wine each year. They makes some of the best Chenin Blanc in the state as the new 2016 L’Ecole No. 41 Chenin Blanc (WWB, 92) is a massive value showing a great combination of richness and poise. At only $15.00 retail, this is one of the best values I have sampled this year out of Washington State. I can remember tasting L’Ecole Chardonnay back to the 2000 vintage and their latest edition from the 2016 vintage (WWB, 91) has a beautiful poise and wonderful range. Do not miss out on their stunning 2014 L’Ecole No. 41 ‘Perigee’ Red Wine (WWB, 93) as this stunning blend of Bordeaux varietals will age gracefully for decades. Learn more about this outstanding winery at http://lecole.com/ Here are the great new wines by L’Ecole No. 41.